Phantom of 42nd Street (1942). In Phantom of 42nd Street, a drama critic turns sleuth when people connected to a former theatrical company begin dying one by one. The film is based on the novel of the same name by Milton Raison and Jack Harvey. As the Law & Humanities blog points out, Brigham Young University Library has produced "Murder at BYU: A Finding Guide to and Annotated Bibliography of Murder Mysteries in the Harold B. Lee Library at BYU Involving Universities, Colleges, Professors and/or Students." It has expected entries (e.g., Dorothy L. Sayers's Gaudy Night, 1935) and lesser known ones (e.g., Florence Converse's Into the Void, 1926). There are drawbacks, however, in the bibliography's reliance on dated sources and absence of periodical references such as Clues and Journal of Popular Culture. Although the bibliography states, "No infor[mation] on author" regarding Converse, an ad for Into the Void in 11 Sept. 1926 issue of the Living Age reveals that Converse (1871–1967) was born in New Orleans, was an assistant editor at the Atlantic Monthly, and lived in Wellesley (the milieu of Into the Void is rumored to be Wellesley College). A graduate of Wellesley College (BS, 1893; MA, 1903) who wrote a history of her alma mater, she also was a poet and playwright who authored several novels such as the mystery Sphinx (1931). In The Riverside Murder, an inspector and an ambitious female journalist investigate when a financier is killed. The film is adapted from André Steeman's Les Six Hommes Morts by Selwyn Jepson (son of mystery author Edgar Jepson and uncle of writer Fay Weldon). The cast include Basil Sydney, Judy Gunn, and Alistair Sim. Black pulp exhibition in Philadelphia. 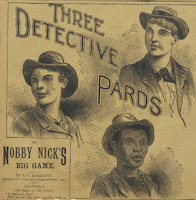 Pards, or, Nobby Nick's Big Game"
"Black Pulp!" is a new exhibition on view until April 29 at Philadelphia's African American Museum, which features art from a century of works such as dime novels and Blaxploitation posters. The contributors include Langston Hughes and Zora Neale Hurston as well as contemporary artists. In this episode of Markham, the lawyer turned private detective (Ray Milland) looks into the case of an elderly woman victimized by a medium. The story is by later Twilight Zone writers Charles Beaumont and Richard Matheson. "DC Women in World War I." As part of Women's History Month, I'll be speaking on "DC Women in World War I" at the March 16 luncheon of the Association of the Oldest Inhabitants of DC (AOI), the oldest civic organization in Washington, DC. I'll also be signing copies of my book In Their Own Words: American Women in World War I. In The Secret Place, the young son of a policeman (Michael Brooke) becomes entangled with jewel thieves. Belinda Lee, Ronald Lewis, and David McCallum costar. This film was Clive Donner's debut as a director.